Glass verandas are an excellent way to create a bridge between your inside and outside spaces, with a sheltered and protected area that also feels fresh and Add stylish extra space to your home quickly and easily with one of the many variations of glass verandas Samson Awnings have to offer. Contemporary styling with the highest quality aluminium sections combined with glass panels to give the roof a permanent all year round alfresco living area to enjoy your evenings in style. 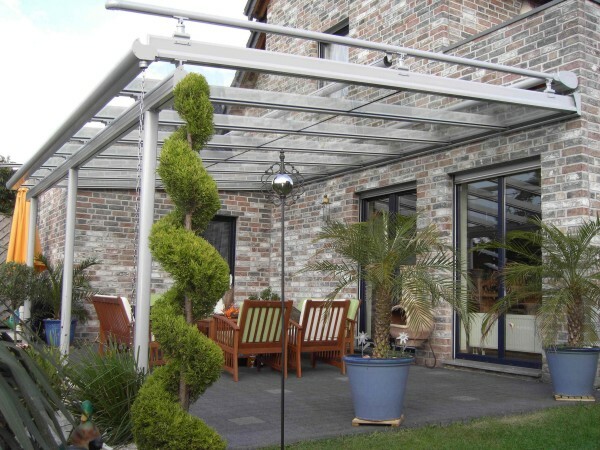 Correctly specified and installed any one of our glass veranda systems can offer very real protection from our very changeable UK weather, something an awning can only offer with serious limitations. The widths and projections available are incredible, with projections from a wall up to 6 metres and widths almost limitless. Our glass veranda systems, either the Samson G6 or the Weinor Terrazza, can also have permanent, folding or sliding glass doors and front sections to offer the ultimate protection and outdoor space in the form of a ‘glass room’ or ‘winter garden room’ as they are generally known in Northern Europe, however the name should not be taken too literally as they are definitely for all year round use. 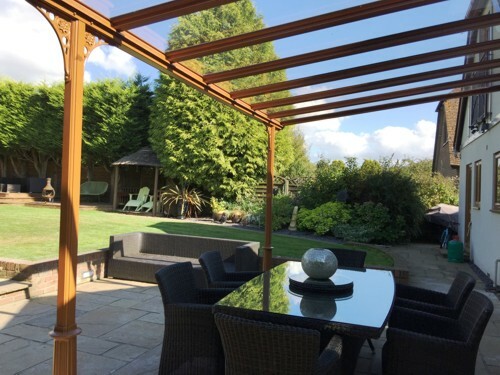 Glass verandas help to extend the usability of your outside space, allowing you a much more comfortable use of your patio and garden area in the evenings. This is especially true when you couple glass verandas with heating and lighting systems, allowing you to maintain both visibility and heating further into the evening, and throughout some of the colder months. 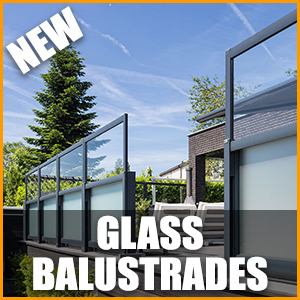 Coupling glass verandas with awnings can also be used to truly help keep the sun at bay, and for more information, click here. Stay outdoors for longer using infrared halogen heating and low voltage spotlights making the use of our Glass Verandas as a permanent and comfortable extension to the living space of your home. You truly are mixing the outdoors with the indoors to give yourself a beautiful area to spend a lot of time with friends and family or just relaxing by yourself. Ideal for all types of entertaining or relaxing, guests can venture out onto your patio even on a rainy summer evening and remain warm. 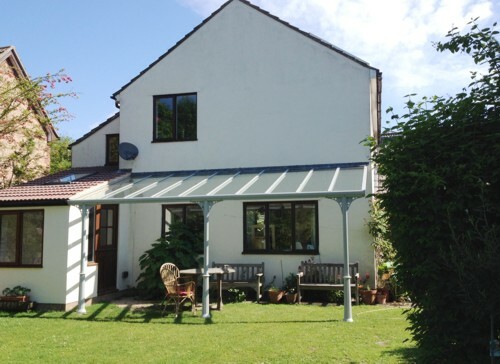 During the day if the sun becomes too strong, open out the built in conservatory awning to control the amount of sunlight entering and control the temperature too, as well as opening the sides and the front for ventilation, something very difficult to do with the average conservatory. 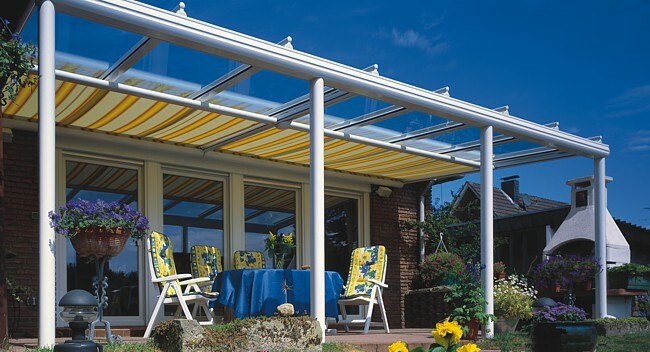 The range of built in awnings available for our veranda systems give ultimate flexibility in specification all dependent on your requirements and the position of the veranda. 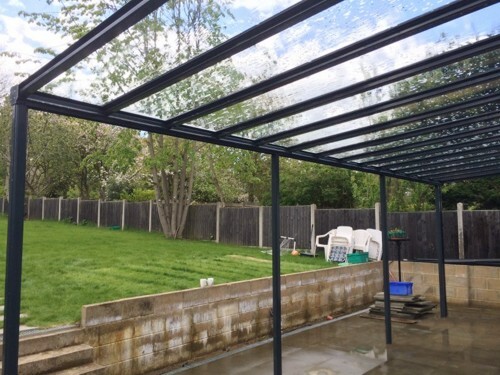 Usually positioned under your Glass Veranda roof the built in awning system will remain pristine throughout its life, protected from weathering, debris or pooling rain water. 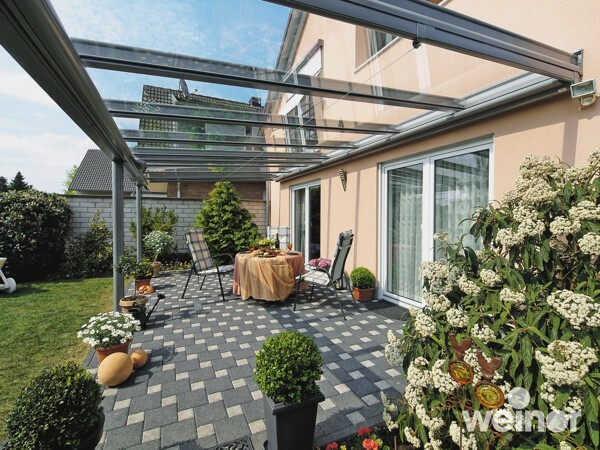 Even after years of use your Glass Verandas fabric will not become stained, weathered or dirty. 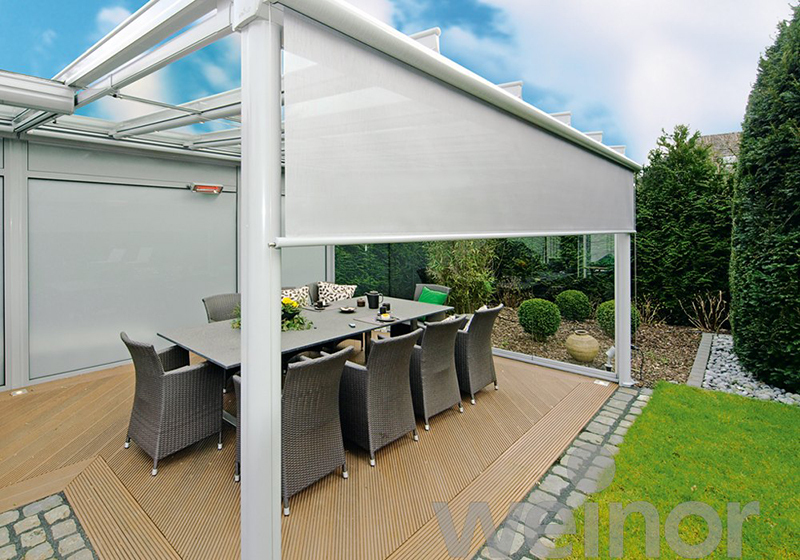 Systems can be specified externally if required and fabrics are produced to cope with external mounting. 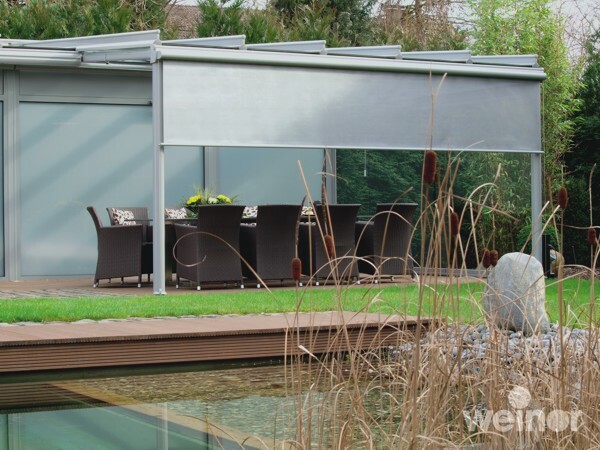 A choice of over 140 fabrics are available and optional side screens can also be used for further control of the micro climate inside as well as privacy if required. A sun sensor, a sun and wind sensor or a sun, wind and rain sensor. 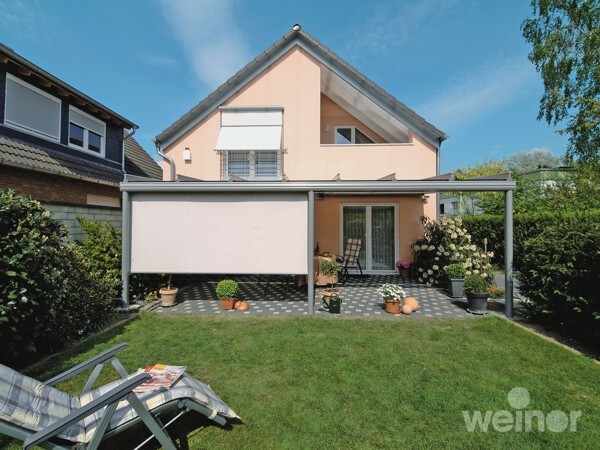 Depending on the version, they automatically open the awning in the sun and retract it in the wind and protection and safety, even when you are not at home for total control with minimum effort. Timers and thermostats can also be specified for controlling your awnings. 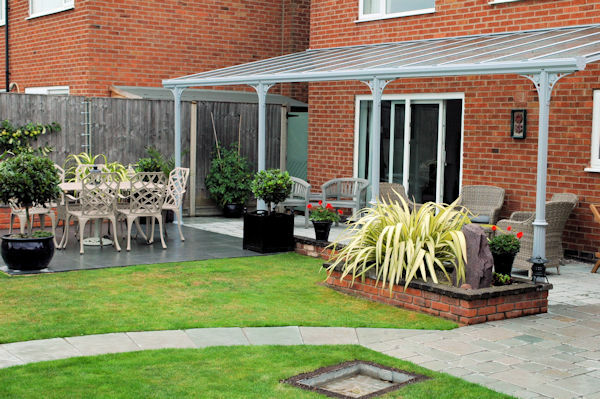 All our glass verandas are constructed from high quality aluminium sections with integrated rainwater guttering and downpipes and ultimate flexibility in shape and design making the most of an area you may well thought was not possible to cover. 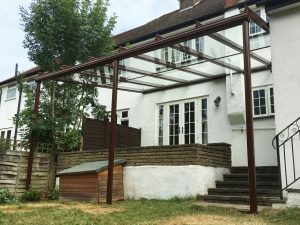 Installation is generally a simple process with no major building work ever required and installation usually complete in 2 or 3 days (depending on size). 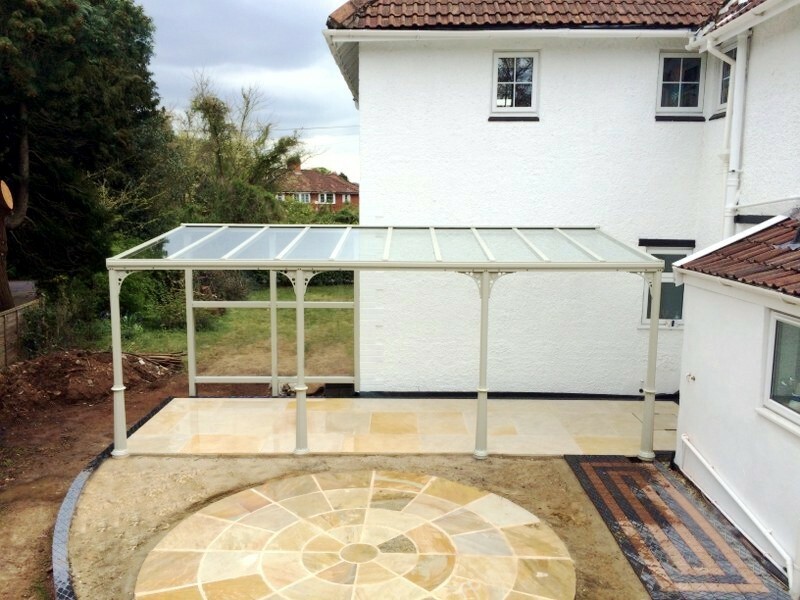 No foundations are generally required for any of the glass verandas, only single points of support are required and they can even be bolted down to a suitable surface reducing disturbance during installation to an absolute minimum. 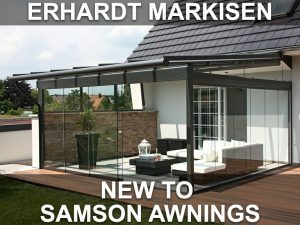 Start to really enjoy your home all year round and your wonderful garden and patio outdoor area in style with a glass veranda system from Samson Awnings. A fantastic investment into any home providing extra space and in most cases planning permission is not required as this system does not require traditional building foundation work.